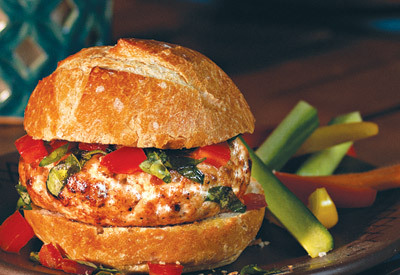 This tasty chicken alternative to a beef burger can fit into a healthful eating plan. The FRESH TAKE adds both flavor and a good source of calcium. Mix first 3 ingredients just until blended; shape into 4 (1/2- inch thick) patties. Grill to 6 to 8 minutes on each side or until done (165 degrees F). Meanwhile, combine all remaining ingredients except buns. Fill buns with burgers and tomato mixture. Prepare using ground turkey breast.